Friends we all were eagerly waiting for Apple's Media Event on 4th October 2011.But all the people who were waiting for this got surprised on 4th October. 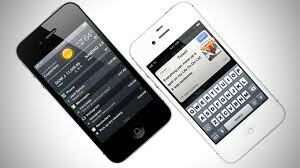 The news was that Apple going to launch iPhone 5 on that day but the event hold by Apple's new CEO Tim Cook has finally opened that this was the launch of iPhone 4S not iPhone 5.
iPhone 4S is available in two color White and black. There are three available model for iPhone 4S. Price for it is about $199 for 16GB , $299 for 32 GB and $399 for 64GB. Height is similar to other iPhones 4.5 inches , width is about 2.31 inches and depth is about 0.37 inches. It weights 140 grams. It has retina display as iPhone 4 having 3.5 inch wide screen. Resolution is about 960 x 640 pixel at 326 ppi. 8 megapixel camera makes it more powerful having LED flash light. We all were waiting to see new look for iPhone but iPhone 4S looks similar to iPhone 4 having slight difference but it is 7 times faster than iPhone 4. But the iPhone 4S is better than iPhone 4 having dual-core A5 CPU and dual-core graphics. It makes multitasking , safari and games faster than before. Let's take a look of new feature in iPhone 4S called "Siri". Siri makes you free from tidies job of typing messages and your notes and activities. You can make calls , send messages by talking to siri. Siri will understand what you are talking and also give you response. 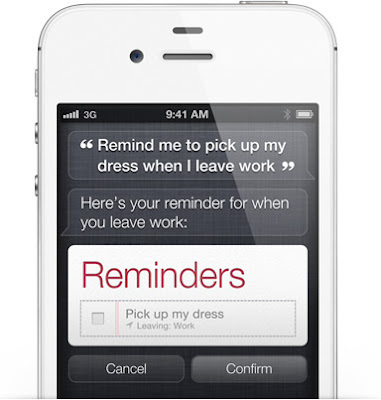 Talk to siri as you are talking with person. Say something like "Remind me to call my wife after 5 min". Siri will start counting 5 min and after it will remind to call. 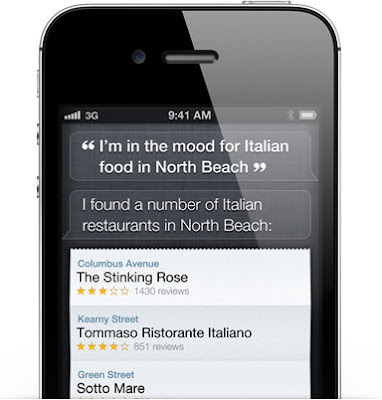 Siri will understand what you are asking to your iPhone. If you say "Help me to find hotel" than siri will search hotel near you and it will reply you. When you need something to do than ask Siri to do that. Siri use almost all the built in apps to find information for you. It also sends email and read mail you received. Also play songs , it can find your way and many more you can do with Siri.